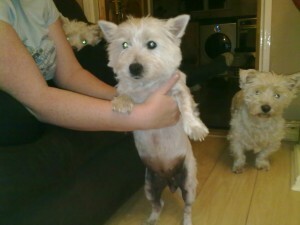 Want to Foster a Westie? Lucy: Follow her Story Here! 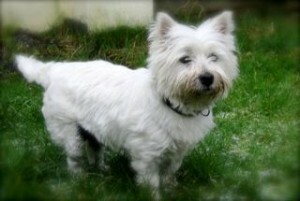 Lucy is a delightful Westie who was surrendered to Westie Rescue on November 20th 2009. Lucy came to us as a result of a marital breakdown, during which we’re told she was left in the back garden for extensive periods of time. Lucy was eventually surrendered along with her Golden Retriever pal Holly, who also has some serious health issues to cope with. Holly is now in the care of Irish Retriever Rescue UK. Lucy the Westie suffers from the horrible condition of Atopy, often called “Westie Skin” (although it’s not confined to Westies). This picture does not show the true extent of Lucy’s condition, as her chest, neck and front legs are also blackened, thickened, and sore. This condition gets worse with time, ignoring it and hoping for the best will not work. The condition gets worse and worse until eventually the dog is in tremendous pain, and requires a comprehensive, time-consuming, often expensive regime of treatment. Lucy not only has Atopy over most of her underside, she was so neglected that her nails had not been trimmed for some time. Her dew claws had grown around in a circle and were growing back into her legs again, causing untold pain as well as a bone infection. Lucy was very restless at first, and found it difficult to settle. Lucy is a patient little lady, but even she could not be kept awake whilst our vet extracted her ingrowing nails, and myself and a vet nurse removed the horrific matting on her legs and bum, which was irritating her sore skin even more. She had a lovely, soothing medicated bath, and was started on the medication she needs to clear the bone infection and make her skin better. Within hours, relieved of the worst of the pain, Lucy turned into a quiet, calm, happy little dog. Little did she know that she was about to fall firmly on her feet! 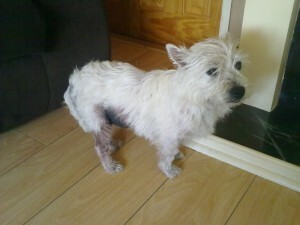 Lucky Lucy was offered a foster home with Auntie Audrey and her family in Dublin. Lucy only moved to Dublin today (Nov 21st 2009), but with Audrey she’ll get all the medication and medicated baths she needs to get her back on track. She’ll also once more know the comfort that every dog should know… a warm, soft bed in the heart of a loving family. 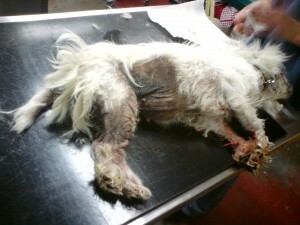 Lucy’s owners allowed her to get into a dreadful state. Cruelty is not just about hitting animals, or starving them. It’s also about leaving them in isolation, suffering from untreated, painful conditions which could so easily have been averted. No domestic circumstances can excuse the neglect and pain that this little lady went through, who knows for how long. Shame on them. Atopy is thought to be inherited, so if you plan to buy a Westie pup, it is critical that you ensure his parents and grandparents were free of the condition. Good breeders are trying hard to eradicate this horrible condition, but puppy-farmers and backyard breeders often aren’t aware of the condition, and don’t care whether their dogs develop it or not, the condition often doesn’t manifest itself until the Westie is about a year old, by which stage your pup’s feet are well and truly under the table. We will be following Lucy’s story here every week, posting new photos of her as she makes her way to recovery, and letting everyone know how she’s getting on. At the end of all this, Lucy will be looking for a new home with a caring, loving home who will never again let Lucy know the hardship she’s endured in a past. It’s a bit over a week since the first chapter in Lucy’s story. She’s settling in really well with her Auntie Audrey and family. She’s on a lot of powerful medication which made her feel ill, so we’ve made a few changes to the dosage to make her more comfortable. One thing’s for sure, the treatment and good care is really starting to take effect! 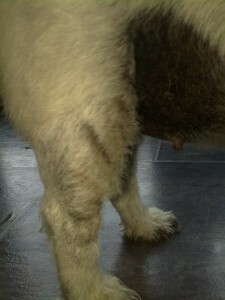 Lucy’s hair is growing back in little patches on her legs, the most badly affected parts of her. She also had a bald patch on her back which has almost disappeared now. Her skin is far less irritated looking and there’s no doubt that Lucy’s in better form as a result! She had some pain where her dew claws had been growing into her legs, but again, we’re getting the pain under control a little more each day. Audrey tells me that Lucy is a wonderful house guest! She’s kindly, patient and adores the kids. She is quiet and doesn’t make a nuisance of herself, and will make a great little companion for an older couple or anyone who has kids coming to visit, as she particularly enjoys the children’s company. But that’s all a little bit down the road yet! 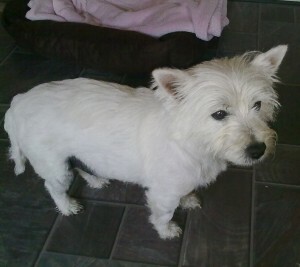 As you can see, Lucy is a very pretty little Westie, and has the temperament to match! It’ll be a lucky adopter who gets her when she’s fully back to health! Lucy is looking a lot better now! 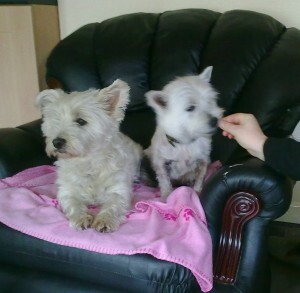 Here she is with one of Audrey’s other Westies, another Lucy! So our Lucy is known as Lucy2. This picture was taken during the week since the last update, and you can really see how comfortable Lucy2 is looking now. Even since this photo was taken, she has improved further. Lucy2 is such a character! She really thrives on routine. She likes things to be a certain way, and not only expects but demands her walks, which she loves! She likes her bed to be in a certain place, and makes sure she won’t settle down until her bed is where she likes it. All in all, she’s a kindly lady, but she likes things to be a certain way, as is befitting an older lady. We call her Mother Superior Lucy, as she’d kind of remind you of a nun! For those who have been enquiring about Lucy2, she is a 9 year old lady (she’d be mortified if she knew I was telling people her age! ), who has re-learned how to be clean in the house: no accidents for ages now! She is very polite around other dogs and is particularly fond of children. She will be a first-class companion for a quieter home where children come to visit, so we’re thinking maybe a retired couple who have grandkids or nieces/nephews visiting. Obviously, her lucky adopter must be prepared for occasional bouts of Atopy and be happy to treat her immediately. She will return your attention in bucketfuls, and will be well worth this little inconvenience! Lucy's tail December 4th: getting better now! 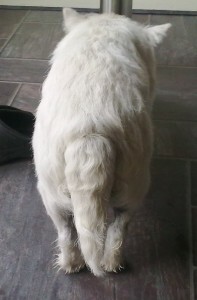 Just to show you how much she’s come on in the past week, here’s a picture of her tail that was taken on the 4th of December. This is a big improvement on her skin when we first got her, when this part of her was damp, oozing and very itchy indeed. But now look! Here’s a picture of her taken on the 13th of December, just one week later! Lucy's tail, December 13th: lots more hair! Lucy is coming on so well. She continues on her medication, and she’s getting those all-important medicated baths every few days. she sure needed her bath tonight, because she decided to dress herself in a lovely coat of dog poop while she was out on her walk: not very nun-like Lucy! Seriously though, this just goes to show that with the right treatment at a much earlier time, Lucy wouldn’t have had to endure the suffering she has gone through. If your Westie starts to show signs of this condition, please get him seen to straight away, by a vet who has experience dealing with the condition. As it is, that dew-claw that caused her trouble when we took her in is giving her trouble again now with the bone infection it caused: we’re going to get this seen to in the coming week as this paw is giving her pain from time to time. And just to update you all further: Lucy’s Golden Retriever friend from her old home (Holly) has recently been adopted over in the UK, and is settling into her new home very well. Well done to all at Golden Retriever Rescue! I don’t think Lucy misses her so much any more, as she’s got plenty to keep her occupied in Audrey’s house. Lucy2 is preparing for Christmas now, dreaming of turkey drumsticks and presents! Here’s Lucy’s latest photo, where she’s posing to show you all how well she looks now that the hair is growing back on her tummy and legs. Lucy has made phenomenal progress, her skin is almost back to normal and she’s in such good form. She owes it all to her Auntie Audrey and family, who have been diligently giving her all the medication she needs, and medicated baths every couple of days. Without all this care and attention to detail, it is unlikely that Lucy would have made such great progress: she’s one lucky lady that Auntie Audrey made space for her in her home. Not only is Lucy receiving the very best of physical care, every emotional need is being catered for, and she is being treated like royalty, just like every dog deserves to be. Yes, she still likes things to be a certain way, and gets quite huffy when one of Audrey’s other Westies crowds into Lucy’s bed, she’ll reverse her way into the bed to wedge the cheeky interloper (usually her pal Lily, she’s the little face you can see peeping out on the left side of the photo) out. 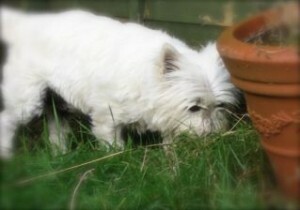 This is the Westie spirit coming out in her, and it’s why we love them! The photo to the right shows Lucy taking a bit of a break from it all, having a little snooze in her very cosy bed: clearly, this little dog is about as chilled out as she can get! Auntie Audrey’s daughter, Robyn, quite rightly felt it would be better if Lucy was wrapped up snug and warm on these cold nights, as her coat isn’t as thick as other Westie’s coats are. Wouldn’t it be great if every dog in the world had someone like Robyn and Audrey to mind them? I bet Lucy doesn’t know her luck, only a few weeks ago she was spending all her life in a garden, with sore skin, sore feet, no walks, not enough food, and no affection. Now, her coat is taking on a distinctly fluffy look, her bald patches aren’t quite so bald any more, she gets the three walks she demands every day, she is a very happy little camper, and just having a rare old time and living the life. Well Lucy, with care like that, you won’t go wrong. She’s making me sleepy just looking at her! 28th Dec: What a transformation! Well, well, well! Doesn’t she look great? Lucy has truly transformed into a beautiful little Westie, compared to the ragged little creature that arrived here 5 weeks ago. I’m sure if Lucy could talk, she’d tell everyone how much great attention, care and love she has had in the past 5 weeks with Auntie Audrey and her family, and how fantastic she feels now that she has received everything she needed to return to full health! Lucy had a great Christmas with all the best of care and food, and of course, her much-adored walks! We hope to have Lucy neutered in January, and get her ready to move on to her new forever home, so look out for her in our Homes Needed section soon. Another bum shot! But no bare skin to be seen! Compare this photo on the right to all the other bum shots above, and it’s clear how much progress Mother Superior Lucy has made over the weeks (although I’m not so sure a real Mother Superior would spend so much time sticking her rear end into a camera…). I’ve visited Lucy a few times over the past few weeks, and I can say that the quality of Lucy’s new coat is beautiful: when Lucy first came in, the bit of hair she had was all wirey topcoat, but now that her skin is well on the mend, there’s been a terrific growth of lovely, soft undercoat. It’s hard to believe that this gorgeous little dog had this luscious coat hiding on us all the time! She is so touchable and beautiful now, and looking very proud of herself! I thought I’d post this close-up of Lucy’s hind leg so that you can see how well the hair has regrown here. I think her hind legs were the worst affected by Atopy, with the skin very thickened and warty. But those days are over now, look at all that new hair and healthy skin! The blackened skin on her tummy and groin is slowly fading to a more normal and healthy pink. and most importantly of all, Lucy doesn’t have to worry any more about itching, scratching and feeling really uncomfortable. No, Lucy’s chief worry now is how quickly she can nag Auntie Audrey into bringing her for a walk. And she does this very, very well! Well, Lucy has been through a lot of changes since I last updated her thread! Lucy went from strength to strength, and became positively fluffy with all the great care she was getting with Audrey and her family! Finally she was well enough to be spayed, which went well for her, and in fact, it turned out that her uterus had been mildly infected (uterine infections are VERY difficult to detect in the early stages). From the day she was spayed, Lucy changed into a different dog! She was much more active, lively and good-humoured, and we were all delighted for her with her new lease of life! Lucy was getting very attached to Audrey and her fmaily, after spending so much time and being so well cared for with them. Being well enough to be spayed also meant she was well enough to move off to a new home. It was not going to be all that easy to rehome Lucy: the older dogs can be a little set in their ways, and Lucy definitely has strong ideas about what is acceptable for Her Ladyship. She was never going to suit an inexperienced owner. 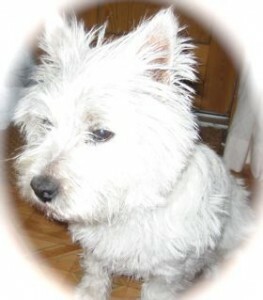 She needed someone who understands and loves the Westie spirit, and we were prepared to wait until the right person came along. And along came Lucy’s Guardian Angel! On 30th January, Lucy moved in to her new home with Carolyn in Kildare. And boy, when you look back at the first photos of Lucy, it is unbelievable to think that this is the same dog! Lucy took to her new home so well, and is really getting settled in now, her adopter getting to know Lucy and her funny little ways, and Lucy getting to know her new mum (who might have funny little ways too, but who am I to say!!!) Carolyn has to continue the medicated baths for Lucy, but we’ve been able to reduce Lucy’s medication and are working our way towards her having to need none at all. Here’s Lucy after having a bath, and isn’t she looking pretty? Mind you, she did so much rooting out in the garden she needed a bath! Lucy is really enjoying having a slave to do her every bidding… yes, she IS getting her 3 walks a day! She’s always delighted to see her mum in the mornings and she really is enjoying life now, a far cry from where she was only 2 short months ago. Lucy is a great example of how help from the Pedigree Adoption Drive is invaluable. Whilst we ask for donations when we adopt Westies to new homes, they cannot possibly cover the cost of getting a dog like Lucy back on her feet. 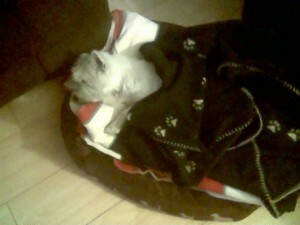 But because the Pedigree Adoption Drive gave us support in 2009, we had the extra funds there which we can use to help very sick little Westies like Lucy, without having to worry about whether we can afford to take in the next dog. 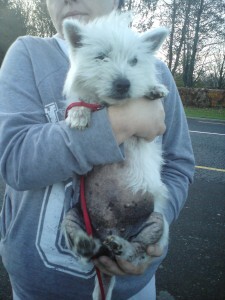 So thanks again to the Pedigree Adoption Drive from all at Westie Rescue! Copyright © 2019 Westie Rescue Ireland - All Rights Reserved. Designed by Paw Prints Web Design.